MERSEY Care NHS Foundation Trust has joined forces with tech for good company and social prescribing specialists Elemental Software to improve the way that it refers patients to help and support at its Life Rooms Centres, in Walton and Southport. The Life Rooms is Mersey Care's state of the art centre for learning, recovery, health and wellbeing. 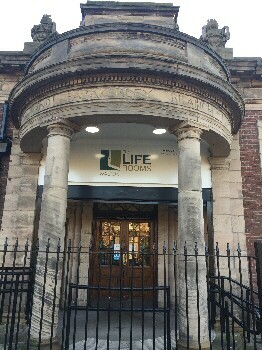 In 2016, its centre in Walton opened its doors after the NHS Trust saved the historic Carnegie building at the former Walton Library in North Liverpool. Following its success, another centre opened in Southport in 2017. As a leading Mental Health Trust and 1 of only 7 NHS England Mental Health Global Digital Exemplars, Mersey Care will use Elemental's unique digital technology to transform its referrals process through its Pathways Advisors, who are based at the Life Rooms and help people using the centre to identify help and support on issues including finding employment, housing, managing money and enrolling on Recovery College courses. The aim of the partnership is to enable more people to engage with the Pathways Programme, provide them with more choice and to free up capacity for the Life Rooms team to help the people that need it. It will also enable Mersey Care to better monitor and track the progress and outcomes of the referrals it makes to understand the difference that its support is making to people's lives. Michael Crilly, Director of Social Inclusion at Mersey Care, said:- "The Life Rooms has been a huge success, with over 22,521 people visiting the centre in Walton since its opening, showing the huge need for this kind of support at the heart of the communities in which we work. Quality, recovery and wellbeing are at the heart of everything we do, and we are delighted to be working with Elemental to enhance the way that we deliver support through our Pathways Programme, significantly improving the way that we make referrals to non medical support and crucially, enabling us to monitor and measure the real impact of these interventions." Elemental Co-Founder, Leeann Monk-Ozgul, added:- "Mersey Care is an innovative organisation that is working to tackle some of the most challenging mental health issues, and it is great to see that social prescribing is playing such a big part in the development of the support it offers at the Life Rooms. Social prescribing is increasingly being see as the way forward in delivering real and lasting health and wellbeing improvements in communities, and our software aims to makes it easier to refer, connect, support and measure the impact referrals. We are looking forward to working with Mersey Care to support its Pathways Programme and add real value in the way that it works with and refers patients to different sources of support in their communities." Elemental Software was set up by co-founders Leeann and Jennifer Neff last year, following years of experience as community development workers in Derry, Northern Ireland, after they recognised that the people that most needed support to manage their own health and wellbeing were often not engaging in the programme and services on their doorstep. They developed a cloud based platform that connects health and social professionals, social prescribers, patients and providers of community based programmes and services to provide commissioners with the freedom and flexibility to shape social prescribing initiatives based on their community infrastructure and needs of their citizens. They work with a wide range of organisations across health, housing and community development to advise on the development of social prescribing programmes and to embed their unique technology to enable organisations to better refer to, and measure, social prescribing activities in their local areas. AROUND 50,000 School pupils across Liverpool and beyond have benefited from a free road safety assembly in memory of a little boy who was killed while crossing the road. 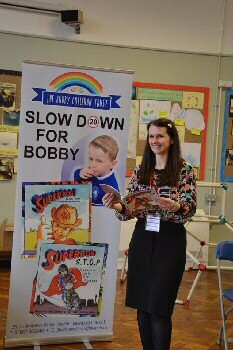 It's estimated that thousands more children will continue to be educated on safer road crossing throughout 2018 as Liverpool author and storyteller Jude Lennon prepares to visit more Schools with her road safety books, as part of the:- 'Bobby Colleran Campaign.' Miss Lennon, a former School Teacher, was commissioned to write new road safety book:- 'Superbob' in memory of Schoolboy Bobby Colleran, who was killed on Leyfield Road, in West Derby, in October 2014. The colourful book was officially launched at Bobby's School Blackmoor Park Infants in September 2016. However, since then, author and storyteller Miss Lennon has rolled it out to a further 192 Schools in Liverpool and the wider Merseyside area. A 2nd road safety book written by Miss Lennon called:- 'S.T.O.P (Superbob Tells Off Parents),' which was published earlier this year, has also made its way into a further 52 Schools. Speaking about the campaign in the run up to Road Safety Week, that runs from 22 November to 26 November 2017, Miss Lennon said:- "This has been an extremely successful campaign so far with almost 50,000 pupils benefiting from a road safety assembly which I deliver when visiting Schools to talk about the books. Both books feature the heroic 'Super Bob' who wears a cowboy hat and red cape and shares his advice with children and adults who are putting themselves and others in danger. Children really relate to the character and as a result of this, I'm confident they also pick up on the key messages about road safety. Our hope is they take these messages, process them and put them into practice by being more aware of the dangers when they are crossing roads. With Road Safety Week coming up later this month it's a great opportunity for parents and teachers alike to reiterate these messages with children and having these books available in Schools will, of course, be hugely beneficial." Miss Lennon was commissioned by the Bobby Colleran Trust, which was set up by Bobby's family following his death. The trust campaigns for road safety improvements and since launched in 2015 has campaigned tirelessly for safer roads outside all Schools. In 2016, the trust teamed up with Radio City to implement:- 'Bobby Zones' outside all Liverpool Primary Schools. This has been hugely successful and now the trust is aiming to get the same zones outside Schools across the UK. Both Superbob books have been illustrated by Alan Jones and Bobby's brothers helped Miss Lennon with the character ideas and content for the story. They suggested using Bobby' favourite catchphrase:- "I'm fuming" which is an integral part of both stories. When visiting Schools Miss Lennon reads from the book and encourages children to think about their own safety when near roads. The key message of the campaign is that road safety is for 'everyone' and children and adults alike need to do their bit to keep 'everyone' safe. All Schools participating in the 'Superbob' campaign assemblies receive a free copy of the book for the School library. Additional book sales and donations go straight back to The Bobby Colleran Trust to pay for the assemblies and educational resources for Schools. LIVERPOOL City Council is to take back control of looking after the City's highways by ending its contract with Amey, by mutual agreement. A report to the Liverpool City Council's cabinet next Friday, 24 November 2017, is to recommend that the 9 year contract for the delivery of highways services (established in July 2013) be closed in the New Year, as part of a drive to deliver £90m of savings over the next 3 years, due to Government cuts. If approved, the Council and Amey will complete the mutually agreed exit by the end of January 2018. The moves comes as part of a Council wide review which has brought parks services, street cleansing, bin collections, IT and HR and Payroll services all back "in house" to deliver further savings. Although cost savings were initially made under the contract, the Council considers that further savings could be achieved in looking at alternative smarter and more flexible delivery methods, as shown with its new pothole repair contracts with the private sector. Following the negotiated exit, it is also proposed that an interim service be put in place for an 18 month period to allow the Council to carry out a detailed review of the various options for future service delivery. ► Street Lighting Inspection and Maintenance. ► Highway Structures Maintenance and Management. ► Client based functions and associated resource be transferred back to the Council. This will include, for example, the highway inspections, street works inspections, project management and work scheduling, and professional services (eg:- design). ► The operational element of the service and the associated resource, be transferred to Liverpool Street Scene Services Limited (or LSSL). This will include, for example, the gully cleansing operatives, the street lighting operatives, and the white works operatives (eg:- flagging works). The negotiated exit from the contract will result in eligible staff either transferring back to the Council or Liverpool Street Scene Limited (LSSL). The detail of those with TUPE rights will be confirmed 28 days prior to transfer/exit. Councillor Ann O'Byrne, Deputy Mayor of Liverpool, said:- "The stark reality of these punitive Government cuts is forcing the Council, to look at every single penny we spend to ensure, not just value for money, but to help protect the vulnerable as much as we possibly can. The highways contract with Amey LG did initially deliver savings but we believe more can be achieved by bringing the operations back in house. We have seen with other services such as street cleansing and refuse collections that insourcing can deliver savings which can be reinvested to make our money go further. Anyone who travels by car through Liverpool knows the City has a pothole issue and the Council is doing all it can. Unfortunately this issue is a double whammy because while we are investing £88m in repairs the Government are putting in just £18m. The Mayor has already written to the Minister highlighting this lack of investment and we will continue to make the point especially while London receives an inordinate amount of transport investment compared to Northern cities like ourselves." Councillor Steve Munby, Cabinet Member for Highways, added:- "I am confident that this proposal will deliver the best possible value for Council Tax payers, help us improve services and deliver savings through eliminating management fees and working with staff and the trade unions to promote innovation." A further report will be submitted to Cabinet considering future delivery arrangements within 12 months of the exit from the contract. 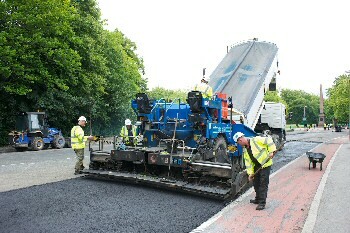 Amey's Highways Business Director David Ogden said:- "We have reached a mutual agreement with Liverpool City Council to end our highways contract early after both sides raised concerns about the sustainability of the contract. The financial environment has changed significantly since the signing of this contract and we both agreed that this is the best course of action for all. Working together since 2013, Amey and Liverpool City Council have maintained the highways and street lighting service across the City, and are now committed to ensuring a smooth transition to a new service delivery approach in the coming months." COMMUTERS from the North West now face an average 56 minute daily journey; the equivalent of 26 working days a year, according to TUC analysis released to mark Work Wise UK's Commute Smart Week. Getting to and from work now takes commuters in the North West an extra 7 minutes a day compared with a decade ago; the equivalent of an extra 26 hours a year spent on congested roads and packed trains. Nationally, commuters are facing an average daily journey of 58 minutes, up 5 minutes from a decade ago. The number of workers facing very long commutes (over 2 hours) is up by 34%, with 3,291,012 now facing very long journeys. Rail commuters face the longest journeys, taking an average of 2 hours and 12 minutes every day; an increase of 4 minutes on the last decade. Drivers spend 52 minutes on the road to work and back (up by 4 minutes), while bus commuters must set aside 39 minutes a day (up by 7 minutes). Cyclists (43 minutes) and walkers (30 minutes) have the quickest daily journeys. Commute times are up across the country... Londoners take the longest to get to and from work:- 1 hour and 21 minutes each day; up by 6 minutes in the last decade. Welsh workers have the shortest daily commute in Great Britain, at 49 minutes. Every English region now faces an average commute time of over 50 minutes a day. ► Low Government spending on transport infrastructure. ► Employers not offering flexible and home working. ► Real wages falling while property prices soar, making it hard to move closer to work. TUC Regional Secretary for the North West Lynn Collins said:- "We're now spending 26 working days a year going to and from work. That's wasted time, which could have been better spent with family and friends. Commutes should be getting shorter, but inflexible bosses and our cash tarved transport system mean we're wasting more and more time getting to work. It doesn't have to be like this. Home working and less rigid hours would take pressure off road and rail. And serious Government investment could give us a transport network that's up to the job."